The remaining EH505 projector was installed with a standard throw lens in the main lecture theatre to show videos and de-brief presentations following the training sessions. For similar purposes the Optoma HD300X projector was installed in each of the two smaller and conjoining lecture rooms, separated only by a retractable wall. The solution installed gives the fire service the option of using both rooms as one lecture theatre by retracting the wall. Due to the precision of the install and the 1,600 Lumens of brightness offering Full HD 1080P image quality the presentation can be viewed clearly from all angles. The new 5.5m state-of-the-art facility training centre opened in (August 2015). It includes a four-storey drill tower, a stretch of road with roundabouts and junctions to simulate car crashes, training rigs to demonstrate how fires behave, animal rescue trenches, a drill ground, breathing apparatus teaching area and an auditorium for lectures and presentations. Simon Le Monnier, Electrical Engineer with Castle Grange Technologies, said: The simulations are incredibly realistic and impressive. The imagery is brilliant, bright and big! As the firefighters are so close to the wall whilst they run through the incident, it is vital that the image quality is perfect. 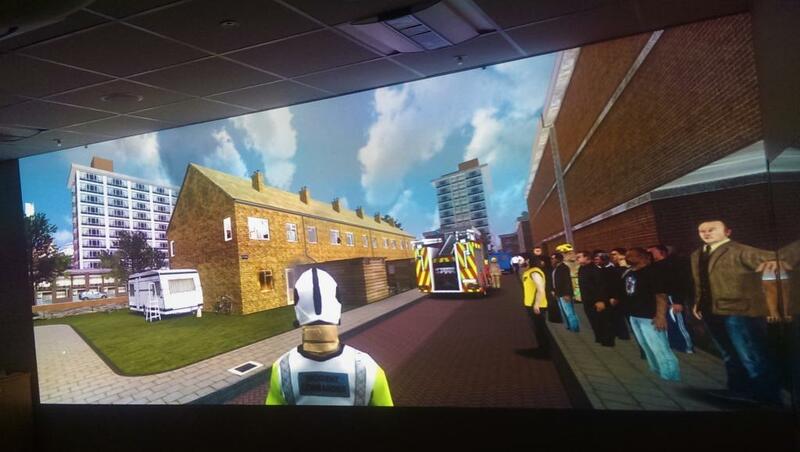 The training simulations provide a realistic and immersive experience that prepares the firefighters with the kind of incident that they may face on a call-out. Stuart Errington, the Chief Fire Officer, said: This new training centre will provide our firefighters and incident commanders with the facilities, conditions and challenges that they need to ensure they are equipped to respond to and manage an ever-expanding range of incidents. The centre will also be available to organisations and businesses keen to use the facilities for their own training and courses.